The hottest selling point for New York City real estate? Specially curated art. Gotham got the stats from three trailblazers merging the two worlds. 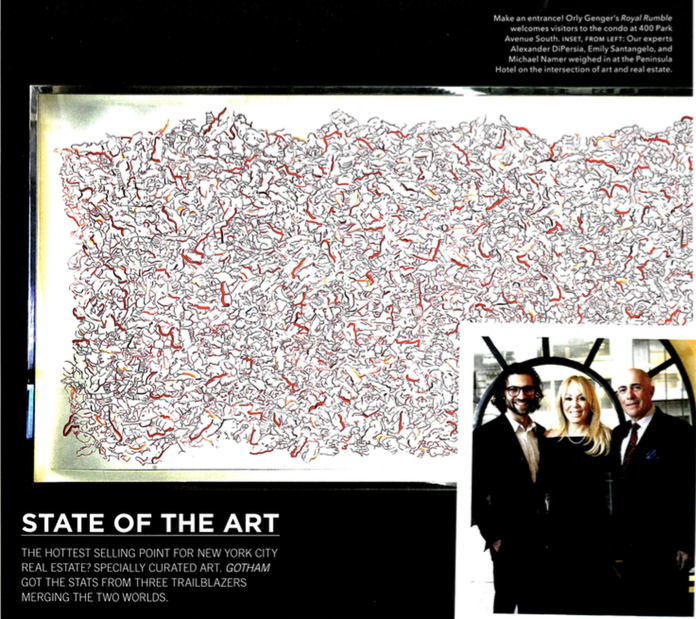 Art in hotels and residential and commercial buildings has become a large factor for buyers. How does that relate to what you’re doing? If you could pick a few artists that you’d love to see gain wider recognition , whom would you choose? AD: Henry Taylor is probably one of the most amazing, under-recognized American artists out there. And he shares a studio with a spectacular painter named Danny Fox, who paints out of LA. There’s also a Belgian artist named Harold Ancart who I love. He has large gallery support, but it’s so hard for things to become part of the public consciousness. ES: Emilio Perez, while having recognition, still qualifies as emerging. I’m incredibly passionate about his work. Ann Agee, who has works in the Brooklyn Museum, does amazing, labor-intensive work. My third pick is a sculptor named John Clement. His work is fantastic; it’s just so vibrant. MN: I love Oscar Dotter—he did a show with us called Polar Ice. He does very cool things, very deconstructive stuff. And Melinda Hackett with her colorful amoebas. In the world of amenities, is art front of mind for you? AD: Art is the number-one status symbol in the world. Oftentimes it’s worth more than the real estate. ES: You can have all the amenities in the world from countertops to green spaces, but art is what really resonates with people. MN: If you’re on Park Avenue and you don’t have art, you’re doing it wrong. Is art in real estate just a trend? ES: It’s not a trend, it’s here to stay!